"I make and sell soap", this is how I met Tyler Durden. The first rule of Fight Club may be that you do not talk about Fight Club. However the unspoken rule is that before you attempt any deconstruction of society you have to be clean. And Luxury Lane Soap have just the right soap for you. "A beat, while Jack's expression turns nervous again about what's inside. Tyler swings the lid up, revealing a full bounty of quaintly-wrapped bars of soap. He gives Jack one. Jack takes it, looks it over. Jack now looks at the bar of soap nervously. He looks at Tyler, slowly smiles and shakes his head. That's right, bars and bars of Fight Club soap to keep you clean while running your underground revolution. 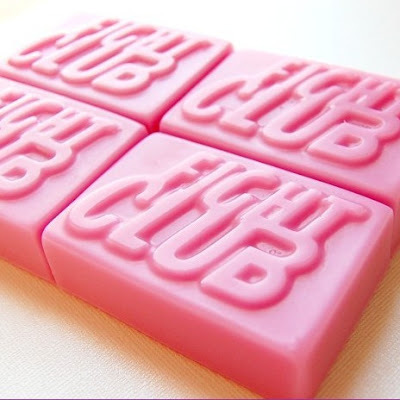 Fight Club soap comes in four scents; I Am Jack (Cool Water), Tyler Durden (Patchouli Smoke), Marla Singer (Black Amber) and Robert Paulson (Clean Laundry). Each bar is blended to have an extra abundant and non-chemical lather, this soap contains soy and wheat proteins to love and baby your skin. Absolutely free of human (and animal) fat. Weighs approximately 99 grams and costs about £2.92.